Nothing is more annoying than a loud, vibrating furnace. So what’s causing your furnace to make that obnoxious sound? Since several problems could cause a furnace to vibrate, you’ll need a tech to visit your home and diagnose the issue. To give you a better idea of what could be wrong, though, we’ll take a look at each of the most common causes of a vibrating furnace. The most likely cause of a vibrating furnace is an unsecured blower fan or motor. Your furnace blower is responsible for pulling in cold air for your furnace to heat, then blowing warm air back into your home. What do we mean by “unsecured”? Well, sometimes the blower motor (or the fan) can shake itself loose from the mounts that hold it into place, creating a loud vibrating sound as it runs. A furnace tech will need to reconnect the fan and/or motor to the mounts that hold it in place. Dirt, debris, rodents (ew!) 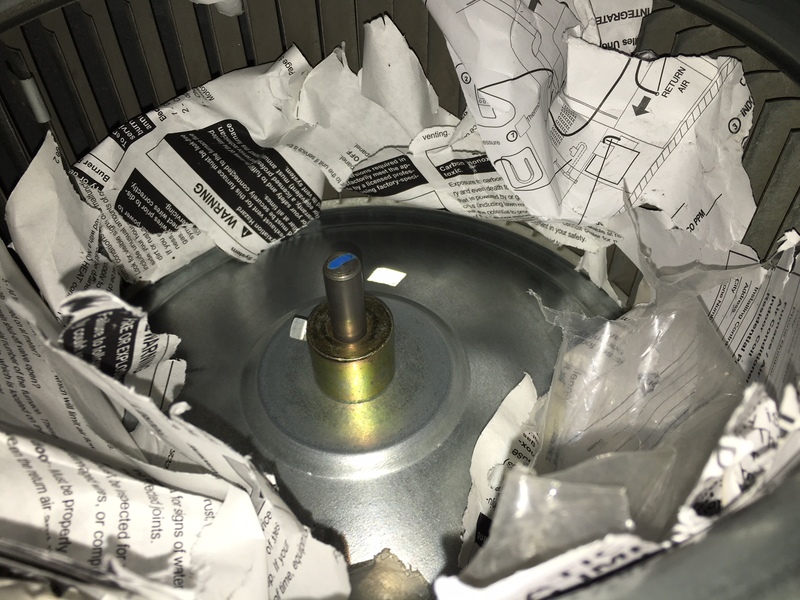 and apparently even a furnace instruction manual can find their way into your blower fan cage. All of these objects can cause your blower to vibrate as it attempts to pull/push air inside your furnace. When the furnace tech inspects your blower, they’ll clean the cage and remove any objects stuck inside. The casing that houses your furnace has metal panels that can sometimes become loose. When your furnace is running and these panels are loose, they can make a loud vibrating sound. You can take a screwdriver and try to tighten any loose screws on the panels. However, if the vibrating persists, then you’ll need to contact a professional for help. Metal ducts are held into place by brackets, which securely connect ducts to each other and vent openings. If ducts become disconnected from each other and/or vent openings, they can create a vibrating sound as air travels through the ductwork. The most common reason ductwork becomes disconnected is because the ducts were installed incorrectly to begin with. You’ll need a professional to inspect your ductwork and reconnect any detached ducts. Or call (913) 856-5801. We’ll send one of our techs to find exactly what’s causing your furnace to vibrate and fix the problem.